By John J. Raspanti, Doghouse Boxing: Julio Cesar Chavez made the first defense of his WBC championship a success by stopping Peter Manfredo Jr. in the fifth round before a raucous crowd at the Reliant Arena in Houston, Texas. Chavez entered the fight a prohibitive favorite but still with some questions. Manfredo had promised to “leave it all in the ring” and retire if he came up short. Chavez (44-0-31 KOs) and Manfredo (37-7-20 KOs) used the first round to feel each other out. Chavez jabbed and circled while Manfredo followed occasionally throwing a punch. In round two, Chavez landed a nice combination to Manfredo’s head. He moved his attack to the body and tagged Manfredo with a good left. Chavez was faster and more fluid while Manfredo stalked but couldn’t land anything that would slow Chavez down. He looked tentative and unsure what to do. The much bigger Chavez continued to show his improved boxing skills in round three by stinging Manfredo with some well placed jabs. Manfredo was getting closed and did trade rights with Chavez near the end of the round. Chavez landed a combination along the ropes that stung Manfredo but didn’t hurt him. Manfredo started faster in round four by surprising Chavez with a lead right followed by a left. 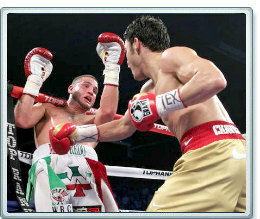 His jab found Chavez’s nose as the WBC champion slowed his attack down. Manfredo drove Chavez back with a nice combination to the body. Manfredo landed another long right to win the round. In round five, Manfredo continued attacking Chavez with his lead right. Chavez was sitting down on his punches but just missing. His jab continued to find Manfredo’s face. The bout had turned from a boxing match to a fight. Manfredo stalked while Chavez was loading up his right. Chavez countered Manfredo’s lazy jab with a hard right hand over the top that sent Manfredo staggering to the ropes. Chavez was on him immediately throwing combinations as referee Lawrence Cole watched closely. Manfredo was blocking some punches but eating others. After another right moved Manfredo’s head referee Cole decided that the Providence native had had enough, stopping the fight at the 1:52 mark of round number five. Chavez was pleased with his victory. Manfredo felt the stoppage was premature but did admit that Chavez's right hurt him. “It was quick, but that’s boxing,” replied Manfredo who reiterated that his boxing career had come to an end. Chavez’s performance was an impressive one. His defense has improved greatly along with his ability to box. His power punches consistently thudded on Manfredo’s frame. The fight was part of the HBO After Dark Series.